Once I started learning that food is more than just nutrition and a need, I realized that spices and flavors intertwine and work together to create the perfect dish. Of course this is subjective and yet, experience plays a huge factor in how people react or enjoy their food. After all is said and done, I believe variety is the main component of being happy. One of the most flavorful and spice filled cuisine that I have experienced would be INDIAN FOOD. Being able to deliver flavors from both end of the spectrum, Indian Cuisine definitely has the variety aspect to make anyone enjoy their meal. Starting July 17th to the 24th, CAFE at The HYATT HOTEL in CITY OF DREAMS MANILA is having the INDIAN FOOD FESTIVAL. Coined as the ROAD to GURGAON, Hyatt brought in Chef AJITH KUMAR from Hyatt New Delhi to showcase the vast dishes that Indian cuisine has to offer. Making use of fresh ingredients and a plethora of spices, the team of HYATT made sure to produce the most authentic flavors with regards to INDIAN Cuisine. To start, freshly baked Indian breads like papadum and roti welcomed the guests to the buffet spread. Appetizers like Vegetarian Samosas and Aloo Tikaa or potato croquette would be the perfect starter for an Indian feast. As this coats and prepares the stomach for the adventure ahead. Traditionally Indian Cuisine is viewed as spicy and a bit hot for the Filipinos and other Asian palettes, as such, the chefs toned down the dishes a bit without sacrificing the flavor profiles. Different types of curries and other delectable dishes were laid out in such a way that it is a feast for the senses. Starting from your eyes to your nose and all the way to your mouth. To give you a proper greeting, the TOMATO TULSI KA SHORBA or tomato soup is prepared in such a way that it isn't heavy nor dragging. It just helps your taste buds get accustomed to the spice-filled nature of the dishes to come. The CHICKEN Curry would definitely be something familiar. Speaking of chicken, the Chicken Tikka is a must try. Properly marinated, one would appreciate the moist and tender meat coupled with Indian spices. Personally, I enjoyed the MUTTON GOSHT ROGAN. This lamb dish is a specialty that would go well with any of the Indian breads or biryani. When it comes to seafood, the PRAWN CURRY was pretty good. The Indian flavors were there but the mango sort of balanced it out. Making the dish somewhat neutral. Another must eat dish would be the PANEER MAKHANI. Basically this tofu like cubes are actually made from cottage cheese simmered in tomato sauce. Use the bread to scoop up the sauce and the cheese. Then, you'll understand. Fish lovers would enjoy the BAKED TREVALLY with MUSTARD YOGHURT. This huge fish is very flavorful that you might get a bit surprised at first bite. The yoghurt flavor was absorbed by the meat making it creamier. To help balance the spiciness of the dishes, a RAITA STATION was put up. This basically has different fresh vegetables and yoghurt and even seasoned rice to mellow down the kick and make everything flow just right. Surprisingly, there are also dessert dishes that had an Indian flare. The Carrot Halwa has a mild sweetness that was somewhat in the middle of the range. I enjoyed it even if it was made out of carrots. The Gulab Jamun and Rice Kheer Barfi were a bit too sweet for me. The great thing about the INDIAN FOOD FESTIVAL at THE HYATT is that they have a lot more in store for diners. 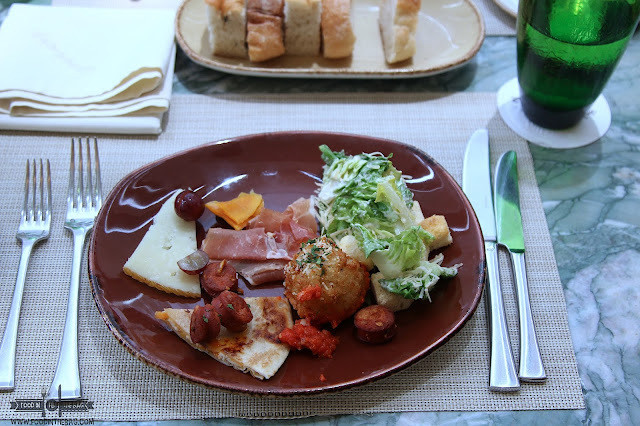 Aside from the INDIAN SECTION, guests could choose from the Chinese, Grilled, Salads, Caviar, Cold Cuts and Cheese, Japanese section and a long dessert spread. PRO TIP: Go on a Sunday and indulge. "THE BEAST" MAYURA WAGYU BEEF is definitely a must try. Remember, mix and match. ENJOY! The ROAD to GURGAON, INDIA would run from July 17-24, 2016. For lunch and dinner buffet, regular rates would apply. (Php 1,388 / 1,888 nett). Metrobank Card Holders get 25% DISCOUNTS at the CAFE and CLUB ROOM accommodations. (June1-Aug31, 2016).